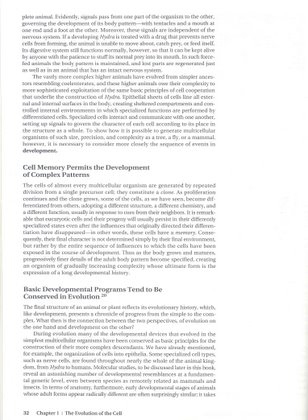 In Randy Olson's pseudo-documentary Flock of Dodos, Olson remarks that he has problems with some of John Calvert's sources. 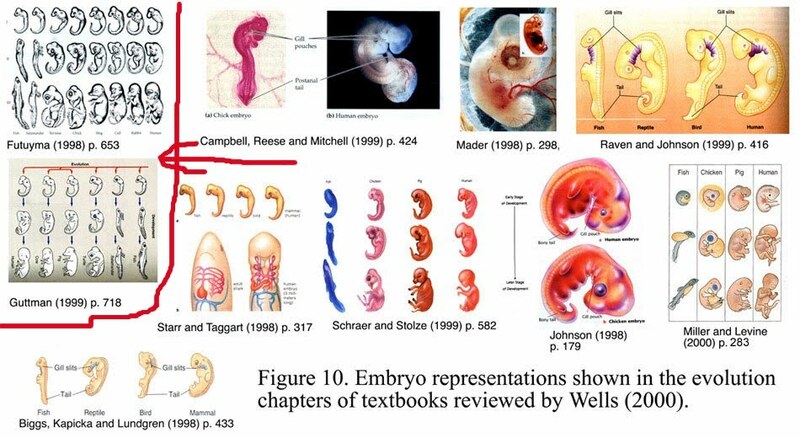 To demonstrate, he asks Calvart about the faked drawings that Jonathan Wells says appears in several evolutionary textbooks. After a prolonged ransacking of Calvart's library they finally do find Haeckel's faked drawings -- in an old 1914 book whose covers are falling off. Okie dokie, so Wells is a liar. . . or maybe not. 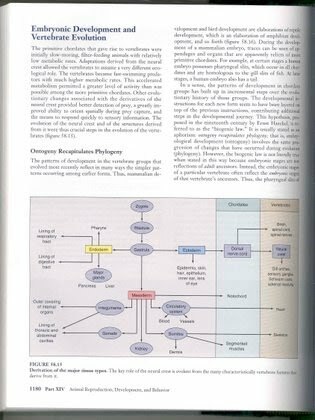 A couple of us had taken evolution classes where we had seen those fake drawings-- was Cornell using 1915 textbooks or something more recent? 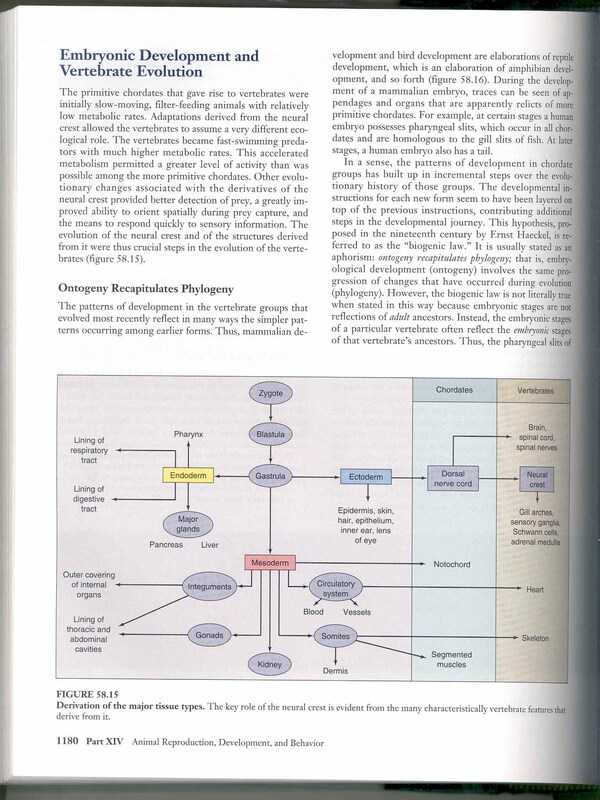 We decided to check out a few biology textbooks to check who was twisting the truth. 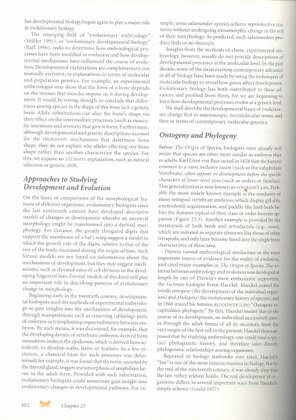 Futuyma's book is probably one of the most common college texboooks on evolutionary biology -- it's used often in Cornell's classes. 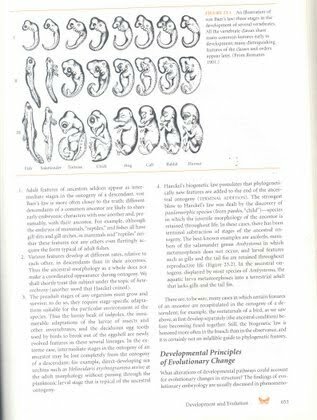 However, we also found Haeckel's faked drawings in Molecular Biology of the Cell (3rd edition © 1994) -- just like Jonathan Wells said we would. 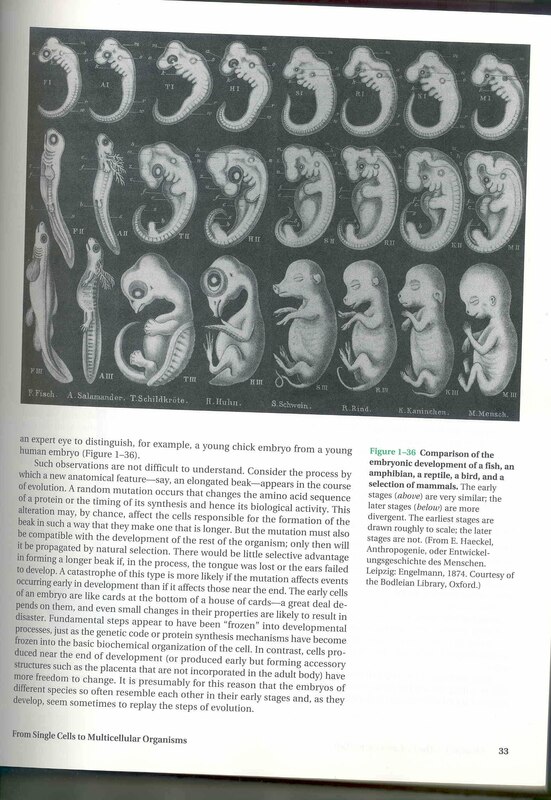 In Icons of Evolution, Wells gives some further examples of books that don't use Haeckel's exact pictures, but do repeat other misinformation. 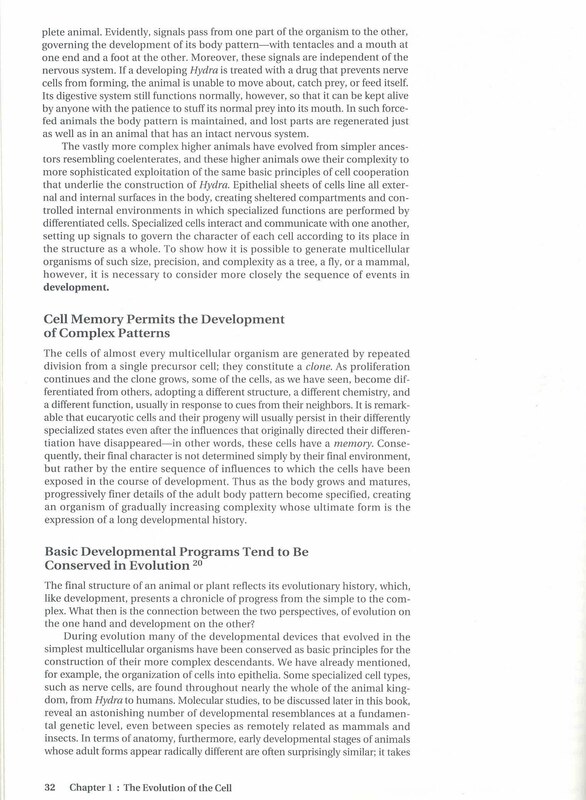 After a little research we came up with even more evidence for Wells' claims. 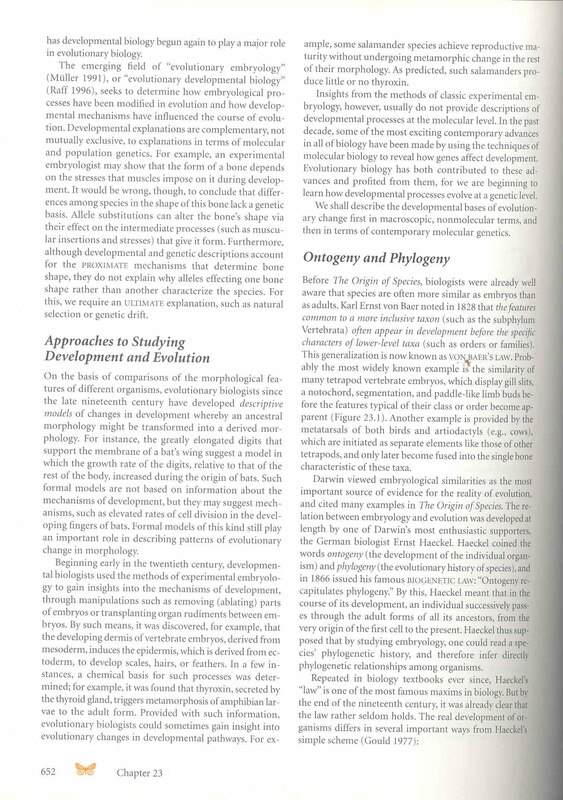 In Biology Raven and Johnson (5th edition © 1999) we have a subtitle called "Ontogeny Recapitualates Phylogeny". 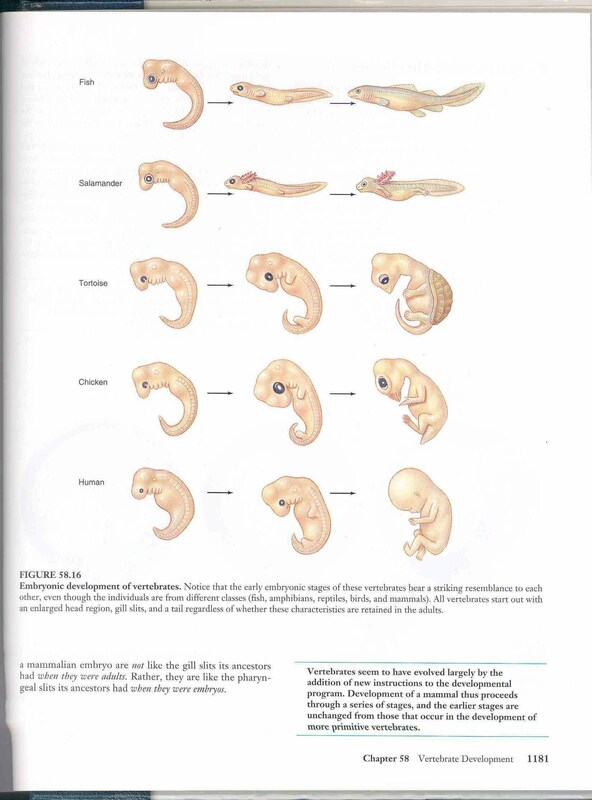 On the following page we have some cartoonish drawings of embryos with the caption: "Embryonic deveolopment of vertebrates. Notice that the early embryonic stages of these vertebrates bear a striking resemblance to eah other, even though the individuals are from different classes (fish, amphibians, reptiles, birds, and mammels). 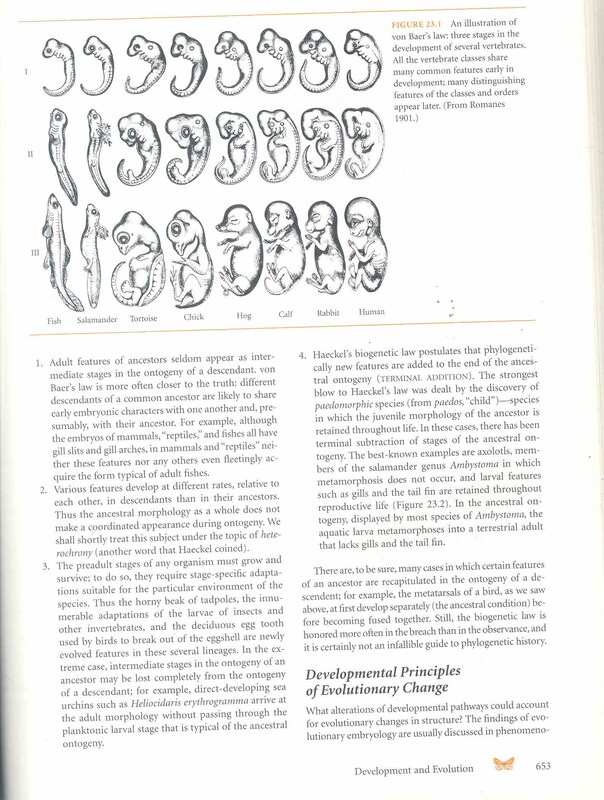 All vertebrates start out with an enlarged head region, gill slits, and a tail regardless of whether these characteristics are retained in the adults." 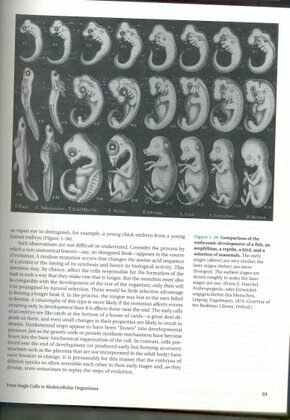 Update: Actually, Randy Olson didn't even need to visit a library to see examples of Haeckel's embryos in contemporary textbooks. 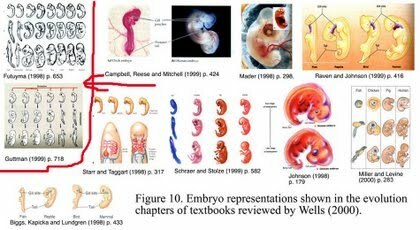 A pro-Darwin site has nicely scanned in two examples, along with other pictures Wells critiques in his book.